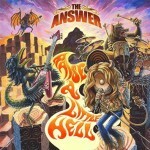 Share the post "Album review: THE ANSWER – Raise A Little Hell"
The Answer are back with album number five and their second for Napalm Records – even better news there as they have signed on for a further two albums with the label. I have enjoyed each album the band have released, even their last album ‘New Horizons’ which was not always well received by some fans. ‘Long Live The Renegades’ is a great opening statement, from the Thin Lizzy approved guitar solos through to Cormac Neeson showing off his fine vocal swagger. They have certainly added some serious heaviness to their sound as can be heard on the title track. ‘Red’ is another heavy ‘un, listen to that bass – you could break concrete with that! Those after the blues stomp the band does so well, hang onto your hats for ‘I Am Cured’. The riffs and rhythm section pound out a big blues rock beat, classic stuff. What I like about The Answer most though is their knack of penning anthems that stick with the listener after one spin. This album has two songs like this, ‘The Other Side’ and ‘Gone Too Long’, either would be perfect for radio airplay. Love the choruses on both and I am sure they will sneak into the live set. This entry was posted in ALBUM REVIEWS, ALBUM REVIEWS (Mobile), All Posts and tagged album, blues, classic, Raise A Little Hell, review, rock, THE ANSWER. Bookmark the permalink.